Celebrated at sundown on the eighth or final day of the Passover holiday (the seventh day for Reform Jews and those residing in Israel), Mimounah is a unique custom observed by the North African Jews of Moroccan origin to mark the conclusion of Passover. During this celebration any foods forbidden during Passover are consumed as a way of symbolizing “freedom” (such as sweet leavened cakes and breads) over “slavery” (the unleavened matzah). Many Moroccan Jews believe that after fulfilling their week-long holiday of Passover, the gates of heaven will open wide (during Mimounah) so that God may hear the prayers of the faithful and bestow abundance and prosperity in the coming year. On this special night, a festive table is covered with a white tablecloth and adorned with foods representing spring, prosperity, abundance, fertility and overall good luck. Because Moroccan Jews once refrained from eating dairy during the Passover holiday (most likely because KLP/Kosher for Passover dairy was once unavailable) dairy products are the highlight of the post-Passover Mimounah meal, and meat is therefore avoided. A pitcher of buttermilk or milk is placed in the center of the table, along with white candles and a small bowl of flour to symbolize purity. Since the number five (chamsah, in Arabic) is believed to bring good luck in the Middle East (referring to the Five Pillars of Islam for the Arabs, or the five books of Torah for the Jews), the flour is topped with five of each of the following: silver coins, eggs, beans and dates. Some hosts will even go so far as to display a live fish swimming in a fish bowl to represent good luck and specifically fertility. 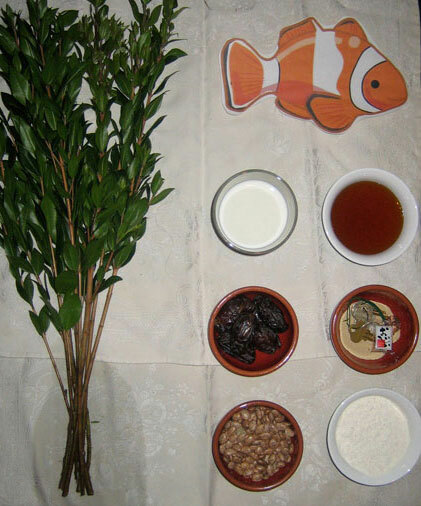 In addition, green stalks of wheat, beans, nuts and lettuce leaves are placed on the table to invoke abundance, while several small plates of honey, sweets, fruits and preserves are served to represent spring and to ensure a sweet year.